The herb Coptis sinensis contained in this product is classified in the Chinese Herbal Material Medica as possessing anti-microbial properties. 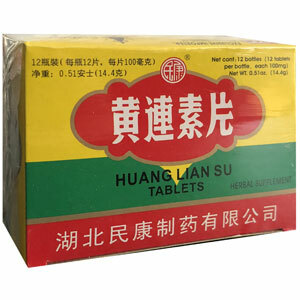 It is commonly prescribed in China for acute diarrhea and bacterial dysentery. Chinese researchers have written about the potential of Huang Lian Su Pian. This herbal nutrient is rich in berberine, an important phytochemical. The herb Coptis sinensis contained in this product is classified in the Chinese Herbal Material Medica as possessing anti-microbial properties. It is commonly prescribed in China for acute diarrhea and bacterial dysentery, and may be used for a variety of intestinal pathogens including the bacteria Proteus, Citrobacter, E. coli, the fungus Candida Albicans, and intestinal protozoa including giardia. Coptis is effective for various strep and staph infections causing tooth abscess, canker sores, strep throat, sinus infection, and skin boil. Intestinal infection and inflammation including dysentery, due to bacilli (rod-shaped bacteria) with symptoms of frequent bloody or watery stools, abdominal pain, vomiting, fever. Chronic amebic dysentery, carbuncles, sores on the skin with pus, conjunctivitis. Food poisoning, gastroenteritis, abdominal distension; also acute and chronic appendicitis, tooth abscess, canker sores, strep throat and sinus infection. Adults, take 2 to 3 tablets, 3 times a day with warm water. Children, take 1/2 tablet, 3 times a day with warm water. Cautions: Coptis is a cold herb. Prolonged use or excessive dosage may cause epigastric pain or gastric upset. Monitor and adjust dose if necessary. Do not use if you are pregnant. Be the first to review “Huang Lian Su Pian” Click here to cancel reply.